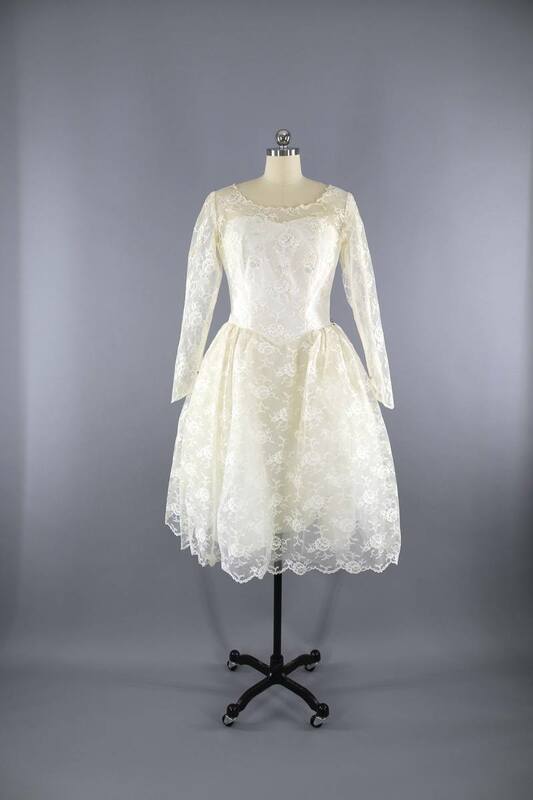 With vintage weddings becoming so popular in recent years, it isn’t hard to see why so many brides are opting for a traditional wedding dress from one of the fascinating historical eras of the past. Whether you love the glamour of the roaring twenties or the understated elegance of the 1950s, there are both authentic pre-loved dresses from the era and modern replicas out there that will bring all the sophistication that you’ve been dreaming of to your special day. We believe that the very best reason to choose a vintage wedding dress is because it really makes you a truly unique bride. Vintage dresses ooze creativity and style as well as a character that can’t be achieved with a contemporary design. Timeless classics really do stand the test of time, and when paired with lovely vintage accessories like a floor length veil or Victorian brooch, you’ll have the perfect look for your day. It goes without saying that choosing a vintage wedding dress is one of the best ways of honouring the past and preserving our culture, heritage and traditions. Vintage style brings nostalgia to the occasion, and whether you’re wearing a family heirloom or a second-hand dress from a charity shop, you are bringing the past to life in the most beautiful way (not to mention fulfilling your “something old” obligation). If you know you want a vintage themed wedding dress but you aren’t sure which era to opt for, we’re here to help you make the difficult choice. Here are the best ideas that can help any bride to embrace historical elegance through the ages. 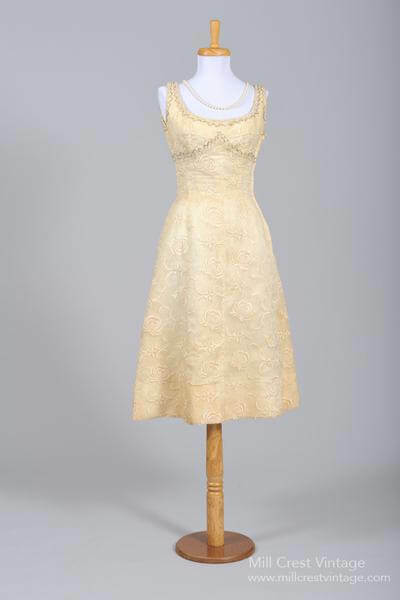 If you’re excited by the idea of an elegant 1950s wedding, you’ll love the retro appeal of a knee-length wedding dress. You’ll still benefit from the classic bridal look of the full skirt and thick petticoats that will make you feel like a prom queen on your big day. Even better, pair the ensemble with off the shoulder puffed sleeves and you’ll have a stunning princess-style elegance that will turn heads as you walk down the aisle. If you’re a bride who appreciates the understated look, the 1940s is the ideal era for you to recreate on your big day. The war years may have been a frugal time, but brides were still wonderfully elegant. Why not choose a beautiful fitted, tailored white or cream skirt suit for a stylish and effortlessly elegant look? Alternatively, a dress featuring lots of tulle and lace, perhaps in delicate ruffles and tiers, would be an ideal choice for a bride who wants something more traditional. The 1930s was a time of effortless and understated elegance. A simple silk or satin bias cut lingerie style wedding dress in white, ivory or cream is the perfect base to pair with a spectacular cathedral length train made from intricate lace. Drop waist dresses also work well for this era, with covered buttons to the back and cowl necklines enhancing the décolletage. Diamante accessories work wonderfully with this look, and brooches enhance any plain floor length wedding gown. The art deco look of the 1920s makes for a beautiful wedding gown. Opt for elbow length sleeves in lace for a true vintage look and pair with some stunning beading or pearl embellishments for the full Great Gatsby look, especially if you choose a short flapper style dress complete with geometric detailing. So, there you have it, the perfect guide to all of the most popular eras for your vintage wedding dress. We’re sure you’ll have found inspiration here for the ideal gown for you, and we know you’ll feel stunning on your big day. Make sure to check out our picks for the perfect groom’s outfit.